The best screen protectors for the Galaxy S7 available on Amazon, eBay, Walmart, and other online stores, are readily accessible irrespective of your location in the US, or the UK. What is a Tempered Glass Screen? A tempered glass is a material which is resistant to scratches because its strength is more than that of a normal glass screens. This strength can be attributed to the layers of material like an absorbent silicone coating, anti-shatter film, and oleo-phobic nano-coating that help to toughen the glass. The manufacturing process involves heating the glass under high temperatures and then cooling off rapidly in a bid to heighten its strength. Therefore, a combination of its materials and method of production helps to give it durability over glass screens especially ones that are neither a Corning Gorilla glass nor a DragonTrail glass. Why do You Need a Glass Screen Protector? Tempered glass screen protectors work against drops thus, slips and falls from certain heights will not mar the Galaxy S7's screen. While a slip from your hand will still keep your screen intact thanks to the tempered glass, forcefully smashing it on the ground or releasing it from a height will most likely damage the screen. These screen protectors help to retain the nature of the screen for a long time where they are not susceptible to scratches especially if you tend to place the phone facedown on surfaces, slide it into a pocket with a key, or your nails are long. Their strength tends to decrease with time due to prolonged use or spider cracks caused by being susceptible to frequent falls. Frequent wipes of the Galaxy S7's screen with materials of different textures will tend to leave scrapes on the screen over time. But then, what if dirt, sweat, and oil are not present in the first place? A glass screen protector is beneficial because it has an oleophobic coating that repels oil and dirt from the fingertips and face. What you'll get, is an ultra-thin screen whose surface is shiny and smooth without sticking to your fingers. Thus, these particles will not be visible on your screen which takes away the need to wipe the screen frequently. Some screen guards like the Spigen Glas.tr slim Galaxy S7 screen protector have anti-reflective properties allowing users to read easily from their screen even under the sun. They eliminate UVB rays and reflected glare from the sun which in turn prevents them from entering the eye of the reader. For this reason, you can read easily, quickly, and for a long period of time from your screen without straining your eyes. Now that you know the benefits of glass screen protectors, take a look at the tempered glass screen protector review for the Samsung galaxy s7 given below. 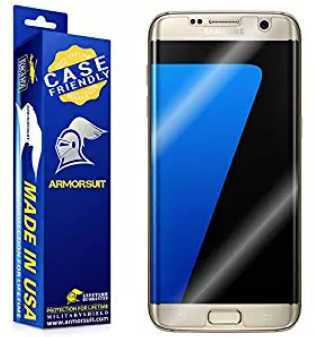 The Armorsuit militaryshield Samsung galaxy s7 edge screen protector should be your first choice considering the fact that this case-friendly screen is made from a material similar to those used to protect military aircraft, helicopters, and space shuttles. This durable glass screen with a perfect fit for your screen protects it against yellowing, bubbles, scratches, and permanent cracks. Thus, it can shield your S7 edge's screen against the effect of sand, rocks, rain, and debris. Its manufacturer, Armorsuit, claims that it has self-healing properties that tend to mend minor scratches on the glass film with time. Packaged alongside this screen protector to aid in an easy installation are squeegee spray bottle solution and microfiber cloth. The removal of this tempered glass screen protector can easily be done by peeling it off slowly with the bare hands. 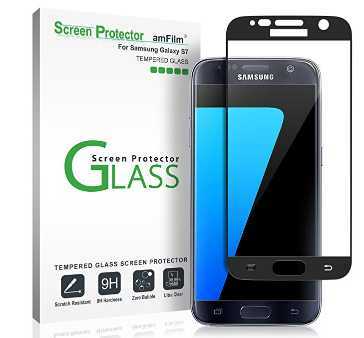 Unlike the Armosuit glass screen that is mainly designed for the S7 edge, the amFilm Bye-Bye Bubble Tempered Glass Screen Protector is designed specially for the Galaxy S7. This is a Dot Matrix glass screen that eliminates any bubbles or halo effects from forming due to the curved nature of the S7's screen. Without air bubbles between the screen or around the phone's edges, maximum protection against drops, bumps, and scratches is assured. Keep in mind that its manufacturer has specified that this glass screen may not be compatible when used with some phone cases, hence, you must use a casing that is the exact cutout of your S7. Asides that, by simply applying this film on your screen, you should begin to enjoy its full capabilities. Packaged with this screen are a wet/dry wipe, dust removal stickers, squeeze card and an installation use guide. From a reputable manufacturer of films for smartphones, is the IQ Shield screen protector for the Galaxy S7. 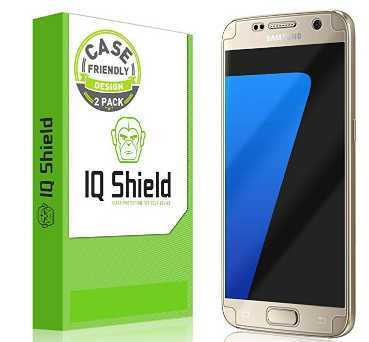 IQ Shield has packaged 2 screen protectors to ensure that your screen is protected at all times and the nature of this glass screen's design makes it compatible with most Galaxy S7 cases. There is an extra space around the borders of the screen in a bid to make it a perfect fit irrespective of the casing you opt for. Moreover, the cutouts for speakers, cameras, and sensors are exact in order not to hinder their functionality. Comparing the IQ Shield with the Armorsuit screen protector, it also has a Smart Film technology giving it self-healing properties that will enable the film to fix itself after minor scratches over time. Thus, you can either maintain the current glass protector on your phone after minor scratches or switch to the second spare screen. Alongside the glass screen, a spray solution, squeegee, lint-free cloth, and intuitive installation instructions are packaged to enable easy installation and removal. Otterbox alpha glass for the Galaxy s7 is one of the best screen protectors for this variant of the S7. In other words, it might not be a good fit when used on the GS7 edge. 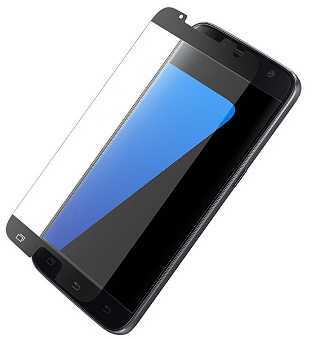 Asides that, this is a tempered glass screen whose strength can protect your main screen from scratches and scrapes. Also, its cutouts for the components of the screen are precise and the level of touch sensitivity is maintained as would've been without the glass on it. With Otterbox glass screen, you can also get the same level of clarity when viewing the screen, while at the same time have some level of privacy since the screen can only be viewed from at a close range. 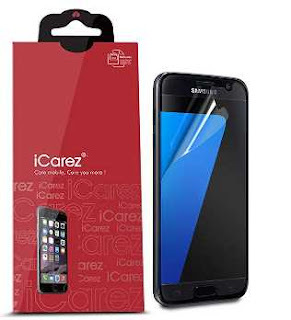 icarez full coverage screen protector for the Galaxy S7 is quite popular not only because it is a cheap screen protector for the Galaxy S7, but it does have admirable features. As a PET Film material, it maintains the resolution of the screen for a retina display ensuring that there is no loss in picture or text quality after installation of the screen. Additionally, this is an Anti-glare glass screen that improves the ability to read from the screen even under the sun. This anti-reflection and anti-UV properties will help to reduce eye strain especially for people who spend long hours viewing their phone's screen. According to its manufacturer, icarez, the smoothness, and sleekness of this matte film provides a natural feel while using the touchscreen. Due to the high cost of smartphones, your best bet is to use the best galaxy s7 screen protector for your smartphone in order not to leave it vulnerable to any potential harm that may weaken the screen. The best is one that can act as a protective shield for dust, oil, scratches, and cracks for your phone while at the same time featuring an anti-glare and anti-reflective coverage to protect your eyes. Do you value your phone and not ready to spend about $150 trying to repair it in future? Then take the next step and purchase a galaxy s7 screen protector on Amazon which will help to maintain the sleek look of your device and enhance your screen's readability.